Calvin Z Laing is a Scottish artist working in moving-image and performance. 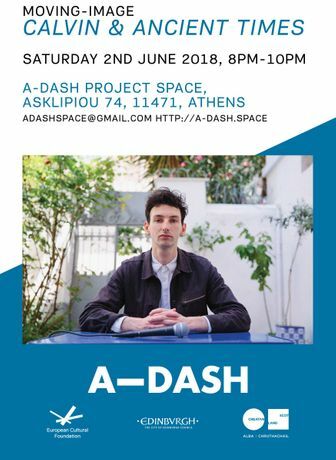 For the past month he has been residing at A – DASH, Athens, observing and making in the city streets, from the nearby islands and from this temporary studio home. Working with unexpected solitude, Calvin has structured his working hours by reading texts, writing this new script, meeting Athens-based practitioners, locals, drinking coffee and eating food. As well as working locally with the A-DASH team, Catriona Gallagher, Noemi Niederhauser and Zoe Hatziyannaki, he has consistently been in communications initiated via facetime, whatsapp, instagram and skype. with Polly Wright, a curator currently at the Dutch Art Institute, and Eva Isleifs, one of the four founders at A – DASH, who, coincidently or rather unfortunately, is currently in Iceland for a project. Quotidian interactions, with people, artefacts and street scenes, from the material used in Calvin’s storytelling, a narrative and script developed in Athens that navigates and brings into question being an artist abroad and developing a practice in another place. Please join us on the 2nd June for the launch of Calvin Z Laing’s new moving-image work ‘Calvin & Ancient Times’ shot at A – DASH in May 2018.